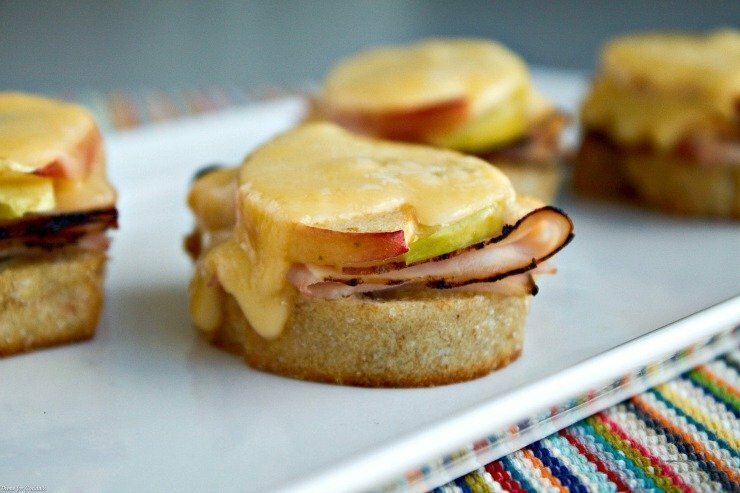 Ham Apple Gouda Crostini are the perfect snack bites for your next party. 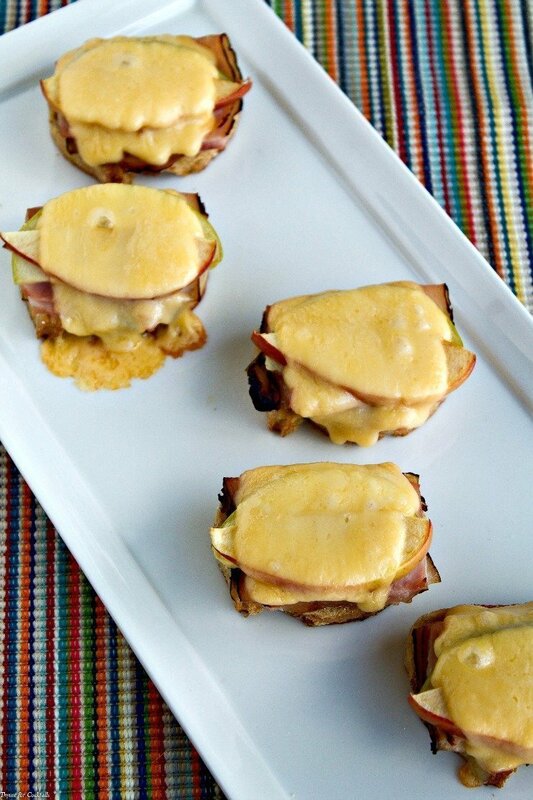 Crispy garlic toasts topped with savory ham, crisp apple slices and creamy Gouda cheese. Over the weekend I really needed some down-time so I stepped away from everything blog related, spent time with the guys and finally started watching Orange Is The New Black. Sunday was an all-day binge watch session in bed after the market and it was glorious! Cooking wasn’t at the top of my list so we pretty much snacked our way through the weekend. 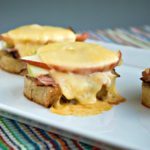 These Ham Apple Gouda Crostini were a combination of farmers market goodies and leftovers out of the fridge. They were quite tasty with a glass of white wine and 11 straight hours of mental relaxation! I have been putting a lot of hours in recently getting things ready for our move to the new casa. We haven’t started packing but we have two lifetimes of ‘stuff’ to go through. Getting married in your 40’s is much different than getting married in your 20’s. We are blending households and it comes with a lot of physical, and emotional baggage. So you see why I needed a little down time. Plus I am getting for ready for my first TV appearance, which is happening on Friday! I happen to be in the right place at the right time last week when a PR rep was looking for a local blogger to do a cooking demo on the local ABC Channel. I will fill you in once I know more details! 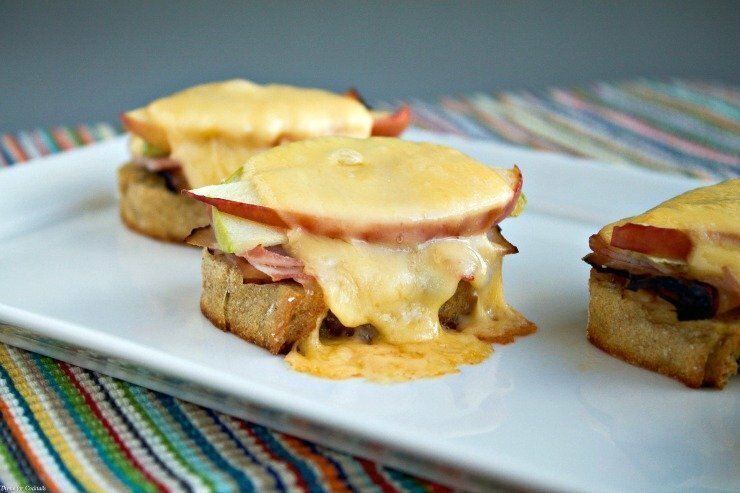 Ham Apple Gouda Crostini are crispy garlic toasts topped with savory ham, crisp apple slices and creamy Gouda cheese. Spread each slice of bread with garlic spread. Place on a large baking sheet. Divide ham evenly among bread. Top with apple slices and a slice of cheese. Bake 8-10 minutes until toasted and cheese melts.